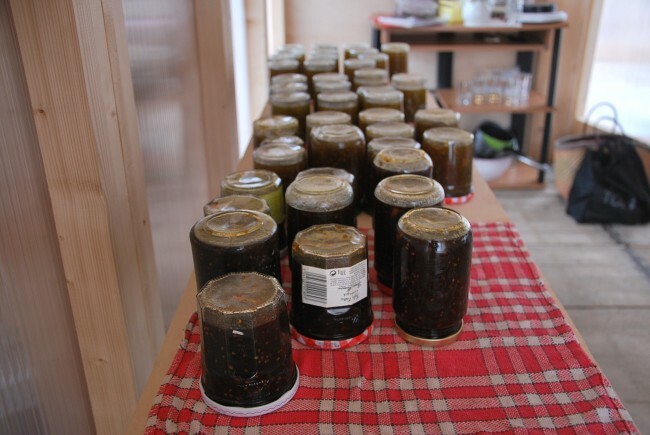 Recently, Agrocite hosted a series of workshops dedicated to making jams and tins with green tomatoes from the garden (see section “Activities” of the website). This was a great initiative as it allowed us to salvage the tomatoes that were beginning to be affected by meldew: No waste AND good taste! Wash and peel the tomatoes. Cut them in little pieces and place them in a big bowl with the sugar, vanilla and lemon. Let them rest over one night and cook them the following day. Once boiling, keep cooking while mixing until reaching the right texture. Make sure the jars have been brought to the boil in order to clean them well. Fill the jars with warm jam, close them, turn them upside down and leave them to cool. It’s ready, you can spread!! Arrange the tomatoes in the pots. Bring the salty water to the boil. Let it cool and fill the jars. Close the jars well.